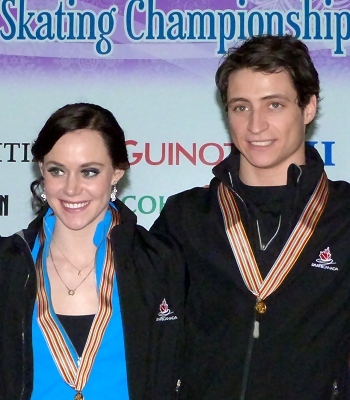 Tessa Virtue and Scott Moir of Canada edged out arch rivals Meryl Davis and Charlie White (USA) by a mere 0.44 points for the lead in the short dance as the 2013 ISU Four Continents Figure Skating Championships kicked off in Osaka, Japan, on Friday. USA’s Madison Chock and Evan Bates finished third. All three teams posted a new season’s best score. Virtue and Moir skated before their toughest opponents in the second warm up group while all three American teams had drawn to skate in the third group. The Canadians really shone in their performance to The Waltz Goes On by Anthony Hopkins, executing their elements effortlessly and bringing across the light feel of the Waltz and the upbeat Polka perfectly. The Olympic and World Champions earned a level four for the first Polka pattern, the twizzles, side by side footwork, and the lift, and were rewarded with a season’s best of 75.12 (37.50/37.62) points. They beat Davis and White by almost one point in the technical mark, but their component score was 0.20 points lower. “We knew we had to be here and compete, trying to build our programs for the World Championships,” he added. The Olympic Games are already on their minds, as Virtue confirmed. “We’re right on track and this has been a great season for us to build,” she added. “We tried new things and really pushed ourselves with what we are doing element-wise. Next year is always different, because you have to be prepared and ready early in the season. Everything comes really quickly in an Olympic year. Davis and White put out a very strong performance to March, Polka and Waltz from the ballet Giselle. The Grand Prix Final Champions were the only team to achieve a level four for both Polka patterns. Their trademark fast twizzles were a level four (and had mostly +3 Grades of Execution (GOE) marks by the judges) as was the lift, but the side by side circular footwork was a level three which made the difference today. The U.S. Champions collected 74.68 (36.86/37.82) points. Chock and Bates danced to a Waltz and Polka from Quidam from Cirque du Soleil and gave a smooth performance, completing a level four lift, Polka sequence and twizzles. The team scored 65.44 (33.79/31.65) points. Like at U.S. Nationals, Maia Shibutani and Alex Shibutani finished behind Chock and Bates and are currently ranked fourth with 63.26 (32.07/31.19) points. The siblings were solid in their South American version of Polka, Waltz and March, but lost points when their second Polka sequence was graded only a level two. The first Polka section, the twizzles, and the rotational lift garnered a level four. However, the U.S. bronze medalists were also behind Chock and Bates in the component scores. They had changed the order of elements in their short dance and now start with the Polka. Canada’s Piper Gilles and Paul Poirier entertained the crowd with their fun performance to Mary Poppins. Apart from Gilles’ wobble in the side by side footwork, their performance was strong as well. They had a level four for three elements, but the side by side merited a level two only. The national silver medalists collected 60.20 points, a seasons best, to come in fifth. Cathy and Chris Reed of Japan, one of the three brother-and-sister teams in the Ice Dance event, are currently ranked sixth at 53.97 points. Their dances appeared smooth, however, were a little slow in places, and they earned a level two and three for the Polka patterns. Canadians Nicole Orford and Thomas Williams left a couple of points on the table with three level-two elements (the two Polka sequences and the side by side footwork). They are sitting seventh with 53.70 points. Danielle O’Brien and Gregory Merriman of Australia placed 8th with 48.81 points.